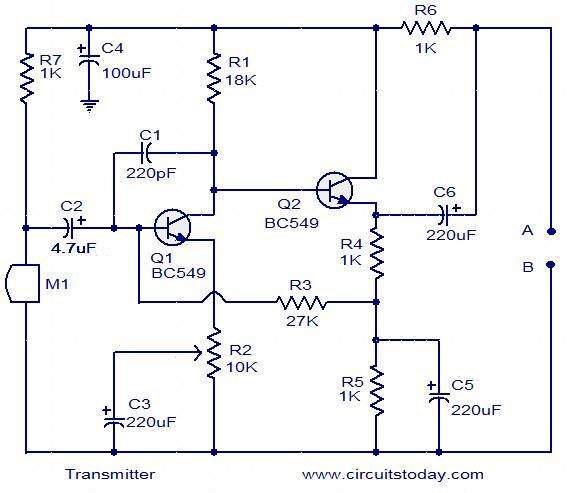 Here is the circuit schematic of a simple audio surveillance system in which the transmitter will pickup sound from one location and the receiver at other location will reproduce it. The receiver and transmitter are connected by only one set of wire. Here both power supply and transmitted signal share the same wire. The audio signals picked up by the microphone will be amplified by the double stage amplifier build around transistors Q1 and Q2.The POT R2 controls gain of the amplifier. The power supply for this circuit is drawn from the interconnection lines itself. The capacitor C4 bypasses all audio frequencies & noise from the line and ensures pure DC for the circuit. The output of the amplifier (audio signal) is coupled to the line via the capacitor C6. At the receiver end the capacitor C7 extracts the audio signal from the line and feds it to the inverting input of IC1 (TL071) which is wired as a voltage amplifier. 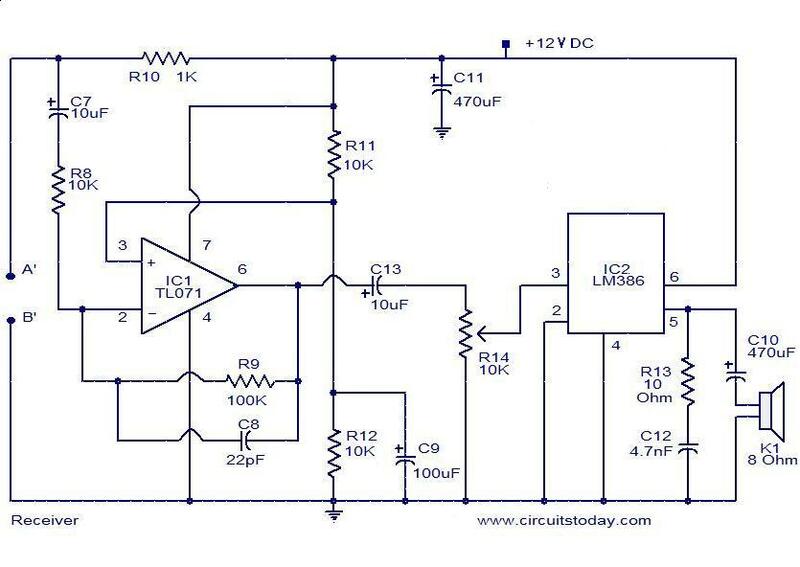 Output of IC1 is given to the input of IC2 (LM386) which is a integrated power amplifier.IC2 provided necessary current gain to drive the speaker. The POT R14 can be used control the gain of receiver. Capacitor C11 isolates audio frequencies and noise from the power supply of both the ICs. Terminal A must be connected to Aâ€™ using the wire of required length. Do the same with B, Bâ€™. The microphone M1 can be a general purpose one. The speaker k1 can be 8 Ohm/2 Watt. POT R2 can be used to control gain of the transmitter. POT R14 can be used to control gain of the receiver. IC1 and IC2 must be mounted on holders. Sir, It will possible wire less ?